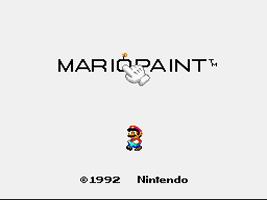 A painting game starring Mario. You start out with a blank canvas and several tools, such as brushes, spraypaint, filler, eraser and stamps. 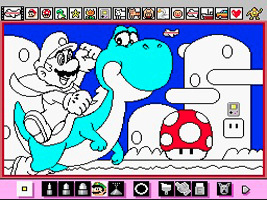 Use the tools to draw a picture using the SNES Mouse, packaged with the game. You can add simple looping animations to your artwork using the animation tool, or compose a music piece to play over the top. When you have put all the pieces together, the result can be saved to the cartridge. You can also call up coloring book pictures, or take a break by playing the Fly Swatter minigame, dispatching the flies without being shot. Game Boy Advance WarioWare, Inc.: Mega Microgame$! One of the stamps you can use in your artwork is a Game Boy. It also appears as a note in the music creator, and plays an 8-bit beep sound effect. On the title screen, clicking the mouse cursor on each of the letters in the title has a different effect. Click on the "O" and it will turn into a bomb and explode, stopping the music. A few seconds later, a strange song will play.